RAPID CITY, SD—Excavating hundreds of miles of trench following the defeat of a Senate bill that would have approved the project, dozens of desperate GOP congressmen were reportedly spotted in rural South Dakota Thursday trying to build the Keystone XL pipeline system themselves. 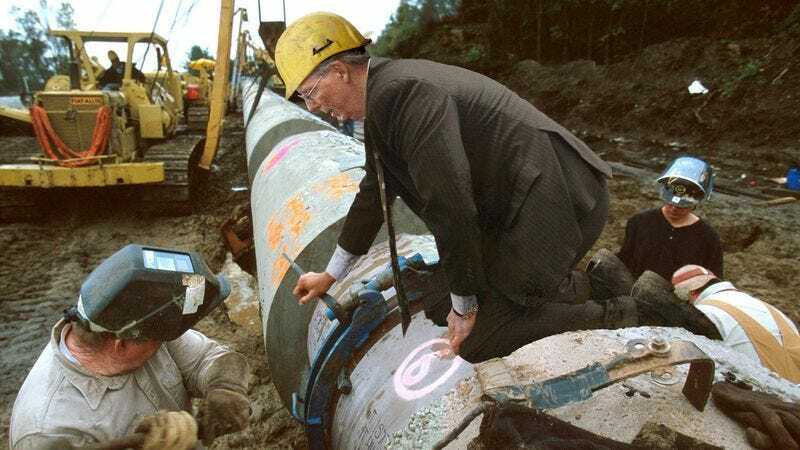 “We really don’t have any other choice at the moment, so we’re going to build the best pipeline we can using our own two hands,” said Senate Minority Leader Mitch McConnell (R-KY), flipping up his welding mask as he paused from beveling an expansion joint to direct a crane operated by House Majority Whip Rep. Steve Scalise (R-LA). “Sometimes if you want to transport 830,000 barrels of crude oil a day from Canada to Nebraska, you just have to roll up your sleeves and do it yourself.” McConnell went on to say that while it might take a long time for GOP lawmakers to complete the 1,179-mile pipeline, the addition in January of approximately 20 incoming Republican congressmen should help speed up construction.